This article discusses coach Steve Ball's DVD and his "West Coast Stack Offense". Coach Ball is head men's basketball coach at Napa Valley College. 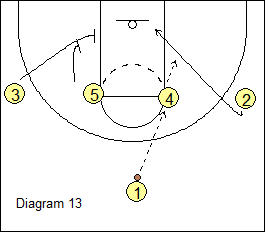 His west coast stack offense starts in a low double-stack and then breaks out into the 1-4 high set. This is an excellent DVD with on-court demonstrations. Several entries into the offense are presented, each with a number of special plays and options to complement each entry. Key practice breakdown drills are presented as well as some game footage. 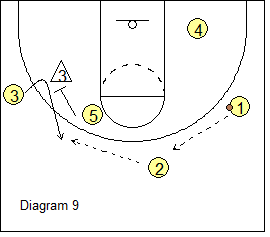 There is a nice pdf file with all of the play diagrams that you can print and add to your playbook. Get the DVD! If you are serious about using the 1-4 high stack offense, you will find this DVD very helpful with numerous options and plays. You can pick and choose those plays that best fit your personnel. Why Use the West Coast Stack 1-4 Offense? Coach Ball points out the advantages and requirements of the 1-4 high offense. Versatility. 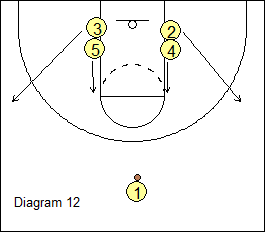 With this offense, you can get back-door plays, face-ups, rip-throughs, ball-screens, back-screens, cross-screens, diagonal screens, inside shots, outside shots, etc. Multiple Entries into the offense. 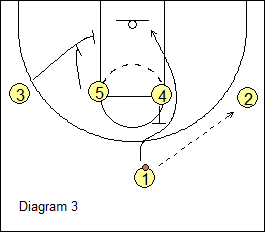 There are three basic types of entries, (1) wing entry, (2) dribble entry, and (3) post entry. Each type has multiple play options, as we will see below. Play to your strengths. If you have a great point guard, use the dribble entry more. If you have good post players who can face the basket and pass well, use the post entry more. 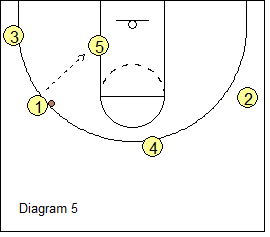 Or with a great wing player and scorer, use the wing entry. If you have a well-balanced team, mix them up and use them all. You can drag the opponent's bigs away from the basket. By moving our post players up to the elbow, the opponent's big post defenders will have to move away from the basket, which not only may be uncomfortable to a big man, but also allows our post players to use their quickness (instead of size) to beat them. Allows you to be creative. 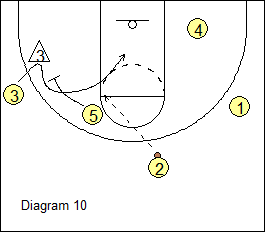 The 1-4 high offense allows for many, many options, possibilities and plays. Requirements for 1-4 offense. You must have a solid point guard who can handle ball pressure. You also need post players who can move away from and face the basket, and can pass well. 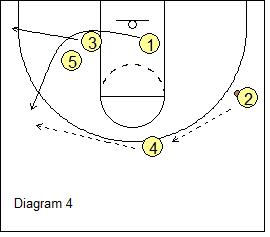 Next, we'll discuss three types of entry into the 1-4 offense - the wing entry, dribble entry, and post entry. All three entries start with the double low stack seen in diagram 1. O2 cuts out to the right wing. O3 cuts out to the left wing. O4 and O5 slide up to the elbows, and now we are in the 1-4 high set (diagram 2). Diagram 3 shows the basic action for the wing entry. O1 passes to O2 on the wing. 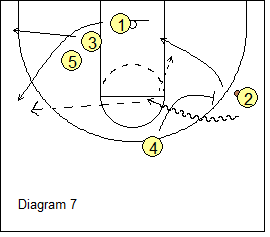 The wing entry is good especially if we have a wing player who can take his defender 1-on-1. O4 steps up to screen and O1 makes the UCLA cut around O4's screen. On the weakside, O3 and O5 set up a double staggered screen, which O1 will use to cut back out to the arc. O2 might pass to O1 cutting through for a lay-up. If O2 is a great 1-on-1 player, he/she might try to take the defender 1-on-1. Diagram 4 shows ball-reversal. 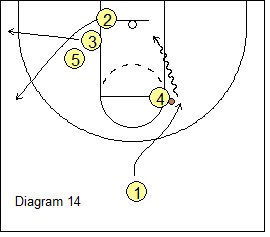 After screening, O4 steps out to the arc and gets the pass from O2. 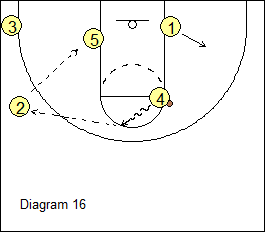 O1 cuts around the double-screen and out to the wing (if his defender is trailing) for the pass from O4. O3 cuts out to the corner. Now we have a triangle with O1, O3 and O5 (diagram 5). 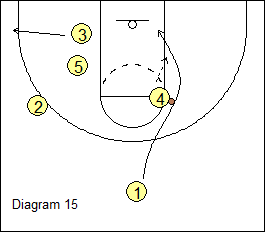 O1 might be open for a 3-pointer, but also looks to pass inside to O5 posting up. Diagram 6 shows what happens if the X1 defender goes over the double-screen (instead of trailing O1 around the screens). Instead of cutting out to the wing, O1 fades to the corner, and O3 cuts out to the wing. O1 (in the corner) might get an open skip pass from O4, or O3 might receive the pass from O4. 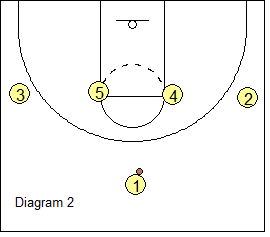 Ball-screen option. 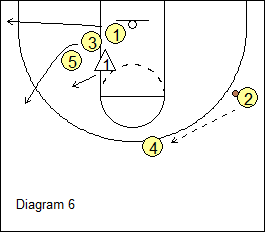 If O2 and O4 are a couple of your better players, O4 can ball-screen for O2 and run the pick and roll from the wing (diagram 7). O2 looks to score, or looks to pass to either O4 rolling off the screen, or a kickout pass to O1 coming off the double-screen. If you have a great point guard, you may want to start the offense with the dribble entry. 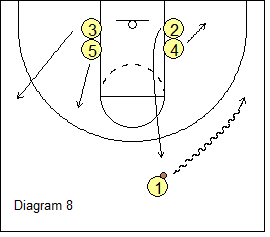 Again, we start with the low double stack (diagram 8), and O1 simply dribbles to either wing (here we show the right wing, but O1 could also go left). O2 cuts up to the top, and O4 posts up for a couple seconds and then moves to the short corner. The opposite wing O3 cuts out to the left wing, and O5 slides up to the left elbow, one step outside and above the elbow. If the quick pass to O4 is not there, O1 reverses the ball back to O2 (diagram 9). Meanwhile, O5 down-screens for O3. O3 has three options (flare, curl or back-cut), depending on how the defender plays the screen. 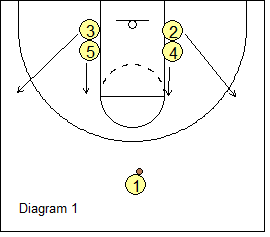 If the X3 defender goes under the screen, O3 could flare to the arc for the pass from O2 and the open 3-point shot (diagram 9). If the X3 defender chases around the screen, O3 should curl around the screen for the pass inside from O2 (diagram 10). If the X3 defender jumps over the screen and impedes O3's cut around the screen, O3 simply back-cuts for the pass inside from O2 (diagram 11). You may have good athletic post players and want to start the offense with the post entry. Again we start with the low double stack (diagram 12). O2 and O3 cut out to the wings, and O4 and O5 slide up to the elbows. O1 could pass to either post player, but here he/she passes to O4 (diagram 13). 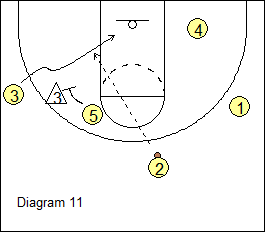 O2 immediately back-cuts for a possible quick pass and lay-up. On the weakside, once again O3 and O5 set a double staggered screen for O2. O2 will cut around that double-screen to either the wing or the corner (depending on the how the defender plays him, as already discussed above). O3 will either fill out to the corner, or the wing, and O5 posts up on the block. After passing to O4, and after O2 starts his/her cut, O1 cuts around O4 for a possible hand-off and dribble-drive to the hoop (diagram 14). Or, O4 might not hand-off, but instead dump the short pass to O1 after O1 cuts around him/her (diagram 15). Diagram 15 also shows O2, O3 and O5 creating the triangle. O4 takes one hard dribble to the left (diagram 16) and passes to the wing (O2). O2 could shoot or look to pass to O5 posting up. Next, Coach Ball presents a number of "specials"... 20 plays, several for each of the three entry options discussed above.